Subject: Response to what are we not getting done. Bill- As noted below we have put the brakes on several of the initiatives that we were working on. To date, licensing actions have not been held up even though we have implemented a process to screen selected nearterm licensing actions and make a determination if additional scrutiny is appropriate. 1. We canceled the meeting with NEI’s Licensing Action Task Force on 3/17 and we informed the LATF that we will not undertake any new initiatives at this time. 2. 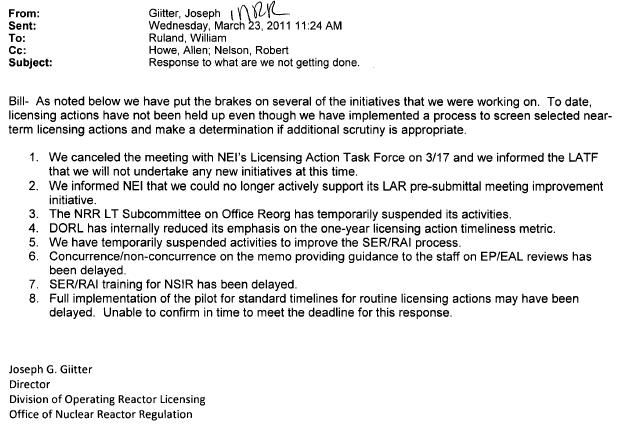 We informed NEI that we could no longer actively support its LAR pre-submittal meeting improvement initiative. 3. The NRR LT Subcommittee on Office Reorg has temporarily suspended its activities. 4. DORL has internally reduced its emphasis on the one-year licensing action timeliness metric. 5. We have temporarily suspended activities to improve the SER/RAI process. 6. Concurrence/non-concurrence on the memo providing guidance to the staff on EP/EAL reviews has been delayed. 7. SER/RAI training for NSIR has been delayed. 8. Full implementation of the pilot for standard timelines for routine licensing actions may have been delayed. Unable to confirm in time to meet the deadline for this response.